Yet here I am, slinging the stuff I first heard about in a postcard from Brita, the friend whose innocent invitation to stay with her in Bali while she was a Fulbright scholar led to, well, my life. If we miss each other at the airport, find your way to Murni’s Warung in Ubud and ask Nyoman where I live. 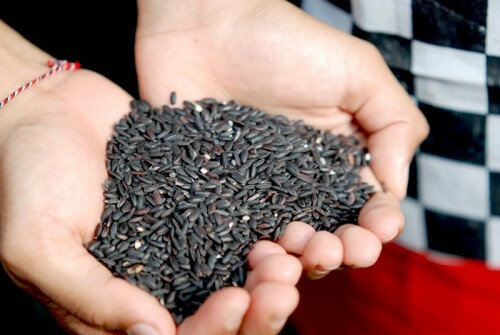 And get the black rice pudding and make sure they put coconut milk “santen” on it, not grated coconut. If you don’t tell them coconut milk they’ll serve it to you with grated coconut and it’s not nearly as good. I couldn’t picture this black rice pudding, and Brita didn’t mention bananas, so for all I knew I was being exhorted by my semi-vegetarian high school friend to seek out a Balinese blood sausage floating in coconut milk. As it turned out, I didn’t miss her at the airport. Dimly lit and thick with the smoke of clove cigarettes, the entire arrivals area was no bigger than the Starbucks that dominates the airport today. From there, Brita, who despite being from New Jersey feared we might get mugged on the dark and empty By-Pass road that led to Ubud, wound me and my Kelty pack on the back of an aging motorbike through the sandy backstreets of Legian. Our terminus was a mildewy room she had rented for one night, and honestly the mid-Eighties-homestay grunge kinda grossed me out, but being waylayed by the shore for that one night did turn out to have its perks. 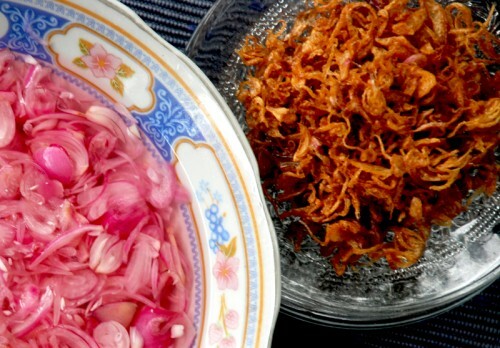 First, at a Padang joint on Legian Road, were the crisp-fried shallots sprinkled atop the steamed rice that anchored the dozen or so plates of Sumatran food laid out before us. The savory dishes, which we ate with our hands and paid for based on what we consumed, were sensational in their own right. But those shallots! My God, they were a revelation. Next? Nasi Campur (Bali’s main rice meal) for lunch the next day at the still-kicking Warung Teges, which at fifty-five cents was slightly less than the emergency motorbike repair—one of many we would fund over the next few months—that we were killing time over. And finally that black rice pudding I’d been wondering about since Brita’s postcard had landed in my mailbox. How was I supposed to know it was actually a bowl of sweet pudding made with black rice? It wasn’t like I could Google Image it, or consult someone’s blog. Topped with fruity Balinese milk bananas and thick, fresh coconut milk, the confection was sweet, and smokey, and creamy, and rendered all the more scrumptious by my months of anticipation. It makes me feel sorry for backpackers and adventurers nowadays. How do you go anywhere without knowing? Knowing what it’s going to look like, knowing who’s going to be there and who’s not, knowing what you’re going to eat, the exchange rate, today’s weather, who’s performing where and what. And rarely wondering what your friends or siblings or parents are up to half way across the globe because they just posted it on Facebook. It’s great to be informed and stay in touch. I guess. But how do you find yourself if you never have a chance to get lost? Fold the pandanus leaf in half and then tie in a tight knot. Place it in a heavy-gauge 4-liter (4-qt) saucepan and add the black rice, sweet rice, water, and salt. Bring the water to a boil, reduce heat to low and simmer, uncovered, for 45 minutes. As the rice thickens, stir frequently to prevent scorching on the bottom, adding water if necessary. Remove from heat, discard the pandanus leaf, and stir in the palm sugar until it is fully dissolved. For each serving, spoon about 3/4 cup of the warm pudding in each bowl. 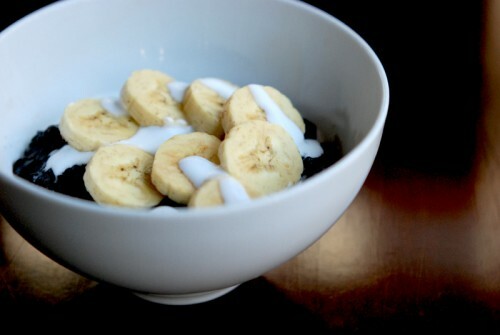 Top with 3 tablespoons of the coconut milk and half a banana, sliced. I have a good friend from my new home/ohana/ family in Hawaii who is visiting Bali – she leaves next week. If she does get to Ubud, I have instructed her to eat at Siam Sally’s and ask for you! Her name in Venetia – she’s lovely. ~ Will, July 18, 2011 at 8:11 am. ~ Kitchen in Surgency, July 20, 2011 at 11:54 pm. ~ joe, July 28, 2011 at 11:21 am. Hello Karen. I miss Bali. I just got back to the states, and I swear, I’ve been dreaming about that delicious black rice pudding since the night I enjoyed that bowl at Cinta Grill with you and the guys. Thanks for sharing the recipe, I’ll make it today! Thanks for being awesome and sharing your Bali with me last month! ~ Jenné @ Sweet Potato Soul, August 5, 2011 at 9:12 pm. ~ Alex H, September 1, 2011 at 12:35 am. ~ Kitchen in Surgency, September 1, 2011 at 10:52 pm.